Within a day's drive from Kathmandu, this amazing two-week trek combines an intimate Tibetan-based cultural experience with a fairly -moderately trek amid both Alpine meadows and thrilling Himalayan landscapes, all without having to fly, or to cross any high mountain passes. The trail brings us into a serene region populated mainly by the Tamang ethnic group, believed to have migrated from Tibet during the time of Ghengis Kahn. The Tamang practice a Tibetan form of Buddhism and work mostly at farming, but one of the delights of this trek may well be the discovery of their beautiful handicrafts.Your adventure begins in bustling Kathmandu, where you will be able to visit Durbar Square or do some other sightseeing if you wish. We will be sure to review your clothing and gear to be sure you are adequately prepared for the trek. Even though we will not be crossing any high passes, there will still be some challenging hills to climb; and we will still need to think about acclimatization, as we will be trekking to a height of (3,860m/t12, 664ft) at Kyanjin Gompa. 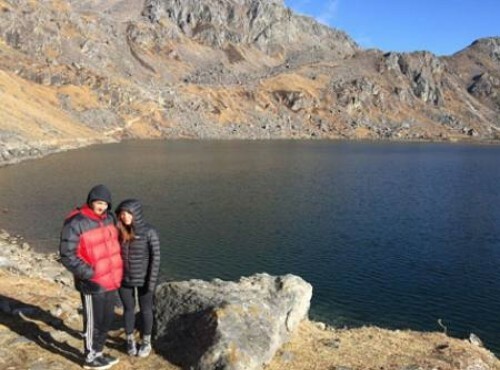 visit the village of Lama Hotel and then the larger town of Langtang, where the headquarters of Langtang National Park are located.In Langtang you will enjoy the views of the twin waterfalls emerging from the rock wall above town, as well as of Langtang II (6,581m/21,591'). You may also wish to explore the quaint upper town, where you will encounter traditional Tibetan-style houses with flat roofs and intricately carved windows. We then trek to Kyanjin Gompa and the highest elevation of our trek. We will have some time for exploration here, before heading back to Syabrubesi, from which we drive back to a farewell dinner in Kathmandu, followed by our flight home the next day. Day 04: Trek from Syabrubesi to Gatlang. Day 05: Trek from Gatlang to Tatopani. Day 06: Trek from Tatopani to Thuman via Brimdang-Nagthali. Day 07: Trek from Thuman to Briddim. Day 09: Trek from Lama Hotel to Langtang village. Day 10: Trek from Langtang Village to Kyangjin Gompa. Day 11: Trek from back to Lama Hotel . Day 12: Trek Lama Hotel to Syabrubesi. Early in the morning, we drive from Kathmandu to Syabru Besi enjoying the scenic views of the ridgeline and terraced farmlands. The stunning scenery of Ganesh Himal can be explored. The pleasant drive then goes through the bumpy road, continually to Syabrubesi via Dhunche. Overnight at Guesthouse. Meal: Breakfast, Lunch, and Dinner . This is a great opportunity to walk through the Tamang heritage community trail by experiencing the Tamang culture and their way of living. Gatlang village is located at the top of the hill, where we can reach after walking through the terraced land. We can visit the nearby monastery and local houses. Overnight at Guesthouse. After breakfast at Gatlang, we head through the Tamang communities and stone steps that lead us to Thangbuchet and Chilime village. We have lunch in Chilime and walk down to the River. Crossing the suspension bridge, we walk up to the Tatopani village. We can have a natural hot spring bath. It is regarded as a skin cure for various diseases/pains or aches. Overnight at Teahouse or home stay. It is a splendid excursion day through the forest and rugged trail. First, we reach Brimdang and Nagthali. The viewpoint of Nagthali at 3165 meters fabulous sceneries of the green hills and terraced forests along with the snowy peaks as Langtang Lirung and Ganesh Himal. Gradually, we walk further to Thuman, which is another superb Tamang village. Overnight at Teahouse or home stay. If you can manage an extra day, we can lead you to the historical site, known as Rasuwagadhi. If it’s not possible to manage that day, then we head further to Briddim via Lingling. Briddim is a beautiful village with the homestay service. The traditional stone houses and fluttering prayer flags resemble the cultural perfection and their spirituality. Stay with local families and experience their daily lifestyles. Overnight at the homestay. From Briddim, we head towards the Lama Hotel through the rhododendron forest. First, we pass Khangjim village, then Bhanjyng Gaon, Sherpa Gaon and Rimche village at last to reach the Lama Hotel. From here, we can join the trek to Langtang valley. Overnight at Guesthouse. We have a short walking today, which is nice for acclimatization. On the way, we pass some of the beautiful tiny ethnic settlements, cheese factory, and cultural diversity. Kyanjin Gompa lies below the Langtang Lirung. The Gompa is a renowned one in Langtang, which reveals the spiritual perfection of the villagers. Overnight at Guesthouse. Leaving Kyanjin Gompa, we gradually descend to Lama Hotel. It’s a rugged trail and dotted with the rhododendron forest. Reach to bamboo, and we take a rest. Overnight at Guesthouse. From Lama Hotel, we start to trek down to Syabrubesi with beautiful memories of the alpine region, culturally loaded Tamang villages and Himalayan views. Overnight at Guesthouse. Early morning, we will drive back to Kathmandu for about 8/9 hours, and you will transfer to the hotel. Getting refreshed, you will be invited for the farewell dinner in a typical Nepali restaurant hosted by Adventure Club. Overnight at hotel. Transportation from Kathmandu-Syabrubesi- Kathmandu by public Jeep /bus. Despite the Bad weather mid-September, i had a wounderful Trek along the Tamang Heritage Trek in the Langtang national Park. The Guide was very expierienced, and i feel that he benefited my trek a lot. Birendra took care of all the paperwork for me, it was a very smooth expierience. I can fully recommend doing the Tamang heritage trek, which is beautiful, and i recommend consulting Birendra at Adventure Club about it. Thumbs Up!